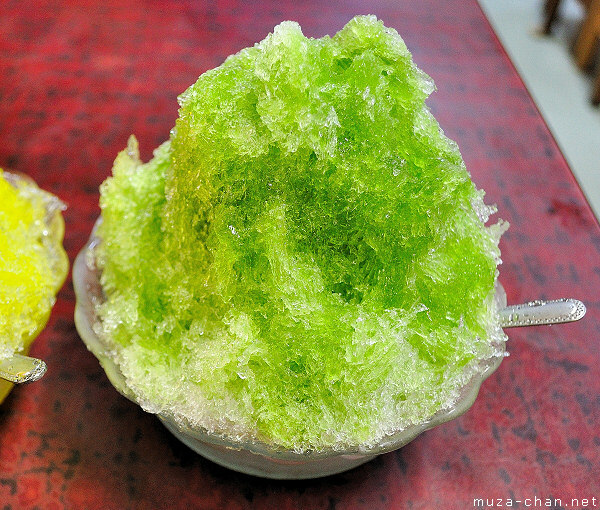 For me, the best way to cool off during a hot summer day in Japan is kakigōri 「かき氷」, a Japanese dessert made of shaved ice flavored with various syrups. If the ice cream does cool you off for a few minutes, a serving of kakigōri will help you fight the heat for a lot more time. Also compared to the ice cream, the feeling of “coolness” will be a lot more intense when you return outside, in the heat. Considered a delicacy at the Imperial Court in Kyoto since the Heian period, kakigōri became available in the form we know today in 1869, in Yokohama and it became a popular treat in Japan around 1920s. How to find kakigōri in Japan? Look for a red-white-blue banner with the 氷 kanji on it. During summer, many stalls, coffee shops, restaurants or even stores have kakigōri and this is the way they advertise it.